Last week, I saw Maria Menounos for the second time in Rockefeller Plaza, which is as disappointing as seeing Tom Brokaw twice, except about a zillion times worse, because it's Maria Menounos. She's still gorgeous despite her sucky interviewing skills. At the beach yesterday, we saw this... ...yeah, that's a deer on the beach! Who knew that was even possible? It was just hanging out under people's umbrellas and looking for snacky snacks. 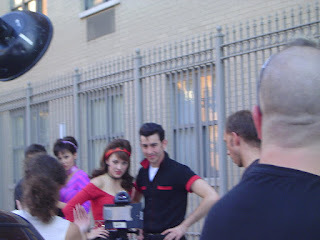 On the way home from the beach, literally steps from my door, Jamie and I ran into Sandy and Danny from the Grease revival... remember that reality show where America voted for the best Danny and Sandy? Well, there they were, standing on my street. Who knows why in the world were they taking photos on my block... it's not that gritty! No pics of our sand chairs? !